The photograph shows a snowman softie that my 9 year old daughter made recently. 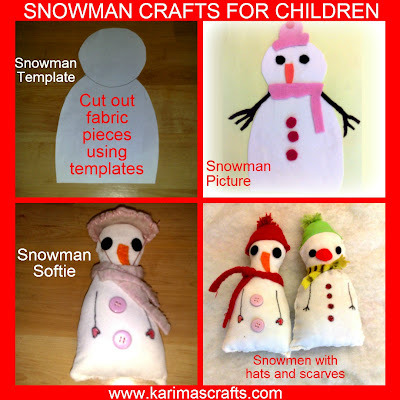 As it is snowing here in the UK, I thought I would share these snow related crafts on my blog. These are really easy to make and as the photograph below shows these can be altered to make crafts for the toddlers/youngsters too! You need to print of a snowman template - these can be found all over the internet! Also make little templates for eyes, nose and buttons etc. 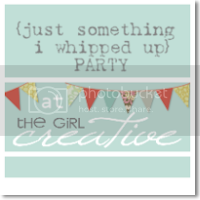 For this project I used my fabric scraps. 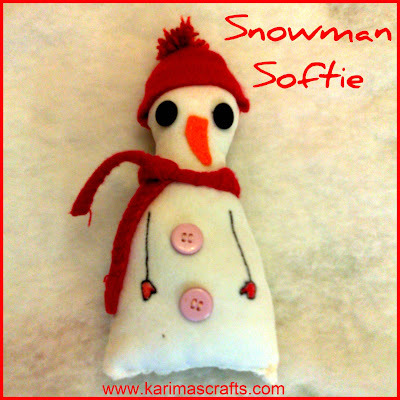 I originally just had my eldest daughter making these but then my 4 year old daughter wanted to make a snowman softie too! 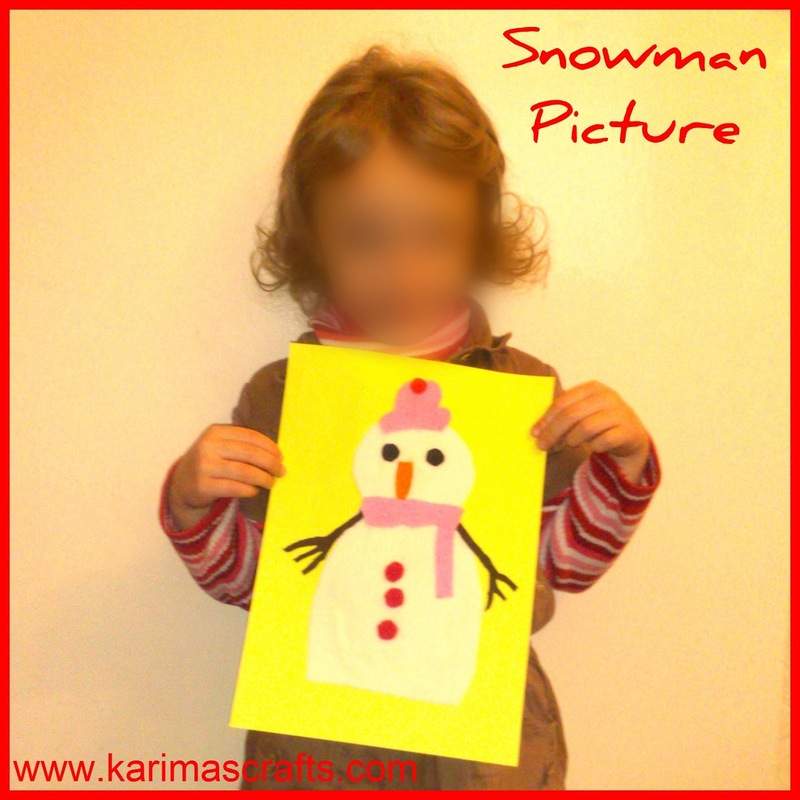 As she is not ready for the sewing stage yet, we decided to make a snowman picture instead. I cut out all the same templates in fabric for her and she put them all together and glued them all down by herself, she really loved doing this! 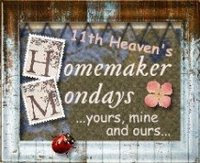 I didn't really plan to make a tutorial on this project so I haven't got any step by step photographs to show - Sorry! However if you want to make one of these softies, they really are very easy to make. Just make sure before you sew together the two main snowman bodies that you sew on the eyes, or fabric paint on your face first! My daughter just made different hats and scarves from scrap fabric she didn't use any particular patterns she just used her imagination! Above is my 4 year old holding her snowman artwork. Love it,, sweet Karima keep sharing more fun! So cute! 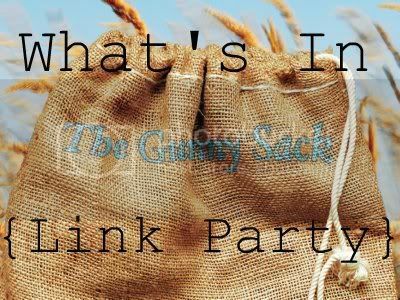 Thanks so much for sharing at Mix it up Monday! Oh, he is SO cute!! I would like to make these for my nieces. 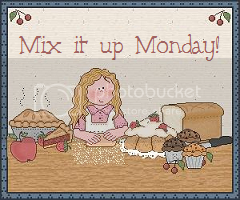 Glad I found you on Mix it up Mondays! I am your newest follower now, too! What a creative little girl! Super cute. 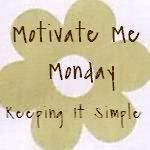 Thanks so much for linking this up with Mop It Up Mondays at i should be mopping the floor last week. Enjoy the rest of your weekend! So glad you like the idea - great winter craft for the kids!